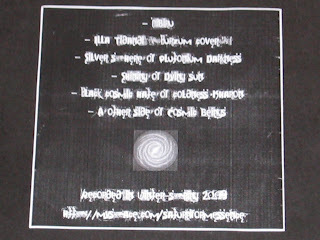 Format: CDr in a black and white paper inlay, originally released in 2009 on Kapustin Yar Records (USA), later self-released by Saturn Form Essence. One thing that you have to credit Saturn Form Essence with is the ability to come up with grandiose titles for its demos. 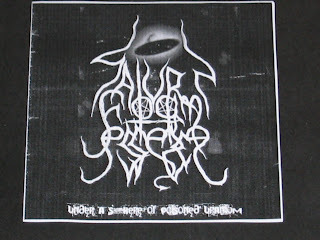 The splendid "Under A Sphere Of Poisoned Uranium" was one of the early releases of the project, and appropriately sets the tone for many of the subsequent titles. "...Criticality in the Fluorinel dissolver could result from exceeding the critical mass or from an inadequate poison concentration. The minimum critical mass for uranium oxide dispersed in a water solution containing 24 g/L cadmium is approximately 19.0 kg of uranium-235. This is based upon a homogenized sphere of uranium oxide and poisoned dissolver solution at optimum density with a 30.48 cm thick reflector of poisoned dissolver solution. The mass limit chosen for the dissolver is 10.5 kg of uranium-235 giving a k -- of 0.88..."
Well, there's nothing like a little light reading to pass the time. Searching for this demo online produces a host of file-share and download links that are keen to offer you MP3 versions of the songs, most likely illegally, but there is next to nothing in written terms about the nature of the music on offer. Allow me to partially fill that vacuum for you. All the tracks are, as you might expect, wholly instrumental but not all are similar in nature. The one track that stands out from all of the others is the Burzum cover song 'Illa Tidandi' (literally, 'ill tidings'), originally on Burzum's "Dauði Baldrs" album with a far longer 10.29 duration. 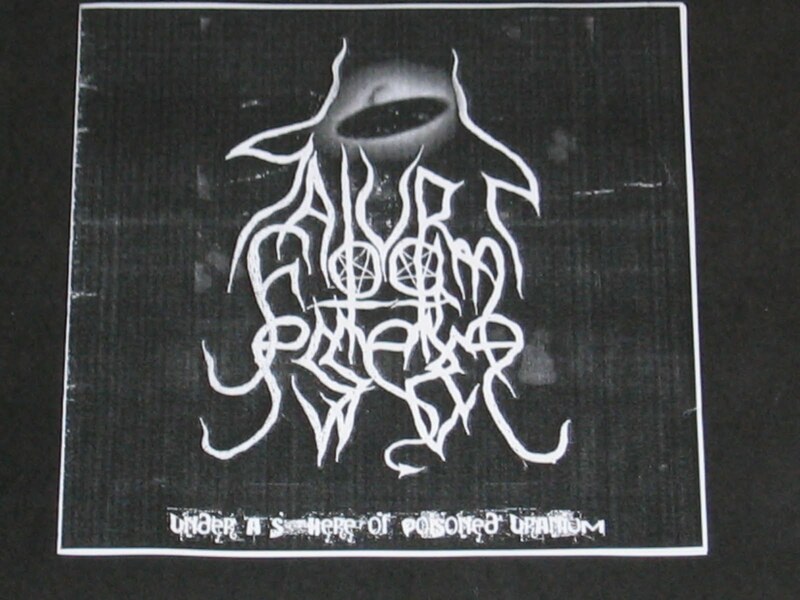 This is a light and fairly insubstantial synth track, which also appears in truncated form on the 2008 Moloch demo "Verdandi" alongside a plethora of other cover versions from bands including Summoning, Emperor and Satyricon. The remainder of the demo has little relating to this rather airy track, instead focusing on presenting a far more choking, churning approach to static-fuelled impulses and pseudo-industrial eminations. The nature of noise and drone of offer is at times almost suffocating, maintains a level of aural barrage throughout the whole demo. The lighter, spacey tracks from later SFE releases are yet to show their heads on this outing, and a oppressive sense of the weight of the universe is conveyed by S. as great slabs of dark ambiance waft past your ears. Opening track 'Nibiru' typifies this approach, and cunningly encapsulates not one but three possible connections to Saturn Form Essence's cosmic theme. Possibility one - in Babylonian astronomy, Nibiru (in cuneiform spelled dné-bé-ru or MULni-bi-rum) is a term of the highest point of the ecliptic. As the highest point in the paths of the planets, Nibiru was considered the seat of the summus deus who pastures the stars like sheep, in Babylon identified with Marduk (the god that is, not the corpse-painted Swedish god-botherers). The second possibility comes through the work of Zecharia Sitchin, which has garnered much attention among ufologists, ancient astronaut theorists and conspiracy theorists. He claimed to have uncovered, through his retranslations of Sumerian texts, evidence that the human race was visited by a group of extraterrestrials from a distant planet in our own Solar System. Part of his theory lay in an astronomical interpretation of the Babylonian creation myth, the Enuma Elish, in which he replaced the names of gods with hypothetical planets. 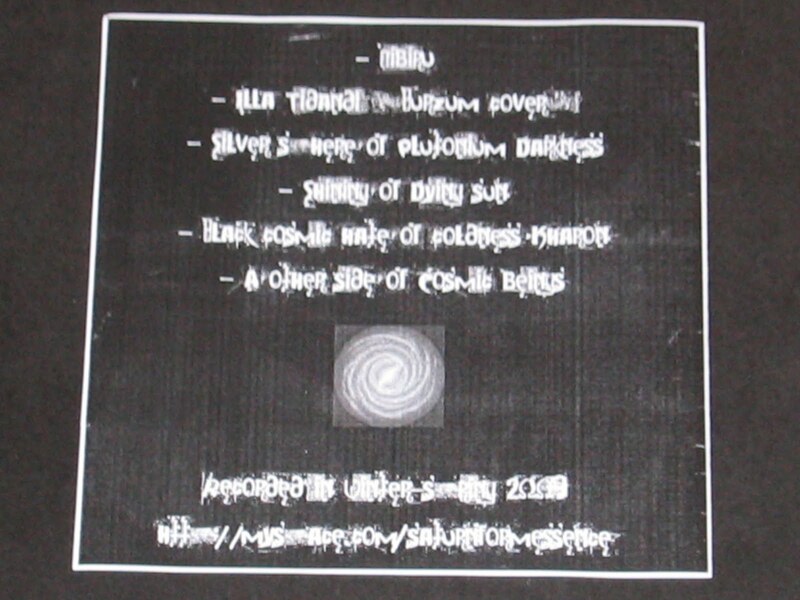 Sitchin's theory proposes the planets Tiamat and Nibiru. Tiamat (the planet that is, not the Swedish gothic bat-botherers) supposedly existed between Mars and Jupiter. He postulated that it was a thriving world in a very different solar system, with jungles and oceans, whose orbit was disrupted by the arrival of a large planet or very small star (less than twenty times the size of Jupiter) which passed through the solar system between 65 million and four billion years ago. The new orbits caused Tiamat to collide with one of the moons of this object, which is known as Nibiru. The debris from this collision are thought by the theory's proponents to have variously formed the asteroid belt, the Moon, and the current inclination of the planet Earth. The remaining songs on the demo continue to a greater or lesser degree the investigation of these dense interstellar machinations. As well as providing us with some terrific song titles (you really can't fault something called 'Silver Sphere of Plutonium Darkness') the demo as a whole takes the listener on a journey through the dust clouds of outer space and into the meditative thoughts of your own personal inner space. Imagine being taken on a flight into the inky blackness by Lovecraft's astral messenger Ithaqua, the roar of the universe pounding your senses as the unknowable depths of space and time fall away beneath you, and you're somewhere on the way to appreciating this complex work.